One of my constant and recurrent joys is to attend the exquisite lectures of the Unveiling the Universe series presented by TRIUMF and held at Science World. Last night we had the pleasure to see S. James Gates Jr., a renowned American scientist who has investigated such awesome and awe-inspiring astrophysical concepts, such as supersymmetry and string theory, who looks a little like Morgan Freeman and sounds a little like Denzel Washington (only somewhat higher-pitched) and who serves on President Obama’s Council of Advisors on Science and Technology. The title of the talk included bits in Italian (L’arte della fisica), but the lecture itself did not contain any words in that language; nonetheless, it was still confusing as it seemed to be about the Art of Physics yet at the same time to deal with how to access one’s creativity app (whatever that meant). I remember having previously read a somewhat similarly titled book The Tao of Physics: An Exploration of the Parallels between Modern Physics and Eastern Mysticism by Fritjof Capra and being quite impressed by it. Towards the beginning of the lecture, Gates Jr. promised math-phobic folks like me that there would be little mathematics involved, but then he showed us slides and slides of mathematical equations. It was quite distressing indeed, while his blunt claim that you cannot be a serious astrophysicist if you do not have the necessary mathematical qualifications was a bit of a downer for me. So much for my own (dashed) hopes of being a hobby-horse astrophysicist in my spare time. Yet at that moment, more than ever, did I realize just to what degree mathematics is similar to a given language. It has its own symbols and notations as well as grammar structure and it is understood only if you have sufficient background knowledge and experience. Gates Jr. compared it often to a musical score (another language of its own); a musician would turn it into sounds in their head whereas a layperson would merely scratch their head over the scribbles and ants crawling up and down the lines. 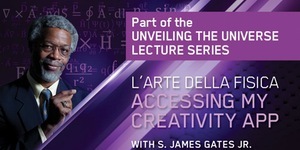 One of the most surprising connections in this lecture was the relationship between physics and the arts. He showed us images and short animations that were representations of some of the equations he had shown us previously. Not that it was any easier to comprehend, but it showed us that the two disciplines could be closely linked and related. I found it most stunning to hear that Schoenberg’s twelve tone technique was just another type of representation of the mathematical Vierergruppe! Gates Jr. also made a point that religion was indeed involved with science to some visible degree. In fact, many are not aware (myself humbly included) that the first proponent of what later was to be known as the Big Bang theory was presented by the Belgian Catholic priest / astrophysicist Georges Lemaître. Initially, he called his theory “hypothesis of the primeval atom” with the even cooler tag of “Cosmic Egg”! Interestingly, his theory of an expanding universe was erroneously (!) contested by Einstein. Although science and religion have had their fair share of shared accomplishments, each side is more often than not wary of the other. This might be perhaps due to the fact that their methodology is rather different. Science is more of a path, with many crooked sideways, while it gets things more often wrong than right. However, when science does it get it right, it is worth all the effort and sweat. Science, overall and in Gates Jr.’s words, is less interested in truth but more in accuracy, while the latter is something that can be measured. Part of the problem is to find the right fine-tuned tools. For instance, the space-time curvature actually makes a sound, as crazy as that may sound! Gates Jr. compared it to a creaky floor in an old house and these sound waves leave traces and can be recorded by equipment that is extremely precise and detailed. Space-time is treated as any other material and physical thing in the universe, which is, of course, mind-boggling to think of. But now it can be even measured! In other words, once proven mathematically, the hypothesis in question would become the accepted and chosen one until, of course, a new, better and more integral theory came along. It might take some considerable time for it to happen, but patience often pays off. For instance, some of Einstein’s theories (excluding his “blunder” about the expanding universe) have been proven to be accurate after all! As Gates Jr. mentioned at some point during the talk, the world is a quantum mechanical one and we have the measurements to prove that. Moreover, there was a consistent focus on imagination and creativity. To quote Einstein, imagination is, in fact, more important than knowledge. At this point, Gates Jr. gave us a personal example. He was trying to think outside of the box and wanted to gain a new perspective on certain theoretical issues. This proved frustrating. However, the best thing to do when you simply cannot crack the code is to let it be. This does not equate with giving up but it is more like giving it a rest for a while. So he turned to comics and to watching cartoons. Ironically, even though we relax our mind, it still continues, like a computer, to process information in the background, i.e. our subconscious. And as he was watching the PowerPuff girls (I assume his daughter was watching it at the time), he suddenly had the answer he was looking for! Taking one of the heads of the PowerPuff girls as an example, he showed us on a slide how it solved the contentious astrophysical issue he had been battling with. Suddenly her head turned into another equation including strings. This was the so-called Muse that worked and operated indiscriminately on both artists and scientists alike. Without imagination, there would be little science after all. And it is all those creative steps from the past that have led to the technological world we enjoy today. Maxwell and Hertz would be pleased to see how their findings were to a large part responsible for today’s cellphone technology, and they might be playing Pokemon Go against each other if they were still alive. Yet with such technological prowess, hazards also appear. The powerful equation of Einstein’s E = mc2 has led to both, a revolutionary form of creating energy as well as the threat (and actual use) of atomic bombs. It is a yin / yang situation, a blessing versus a curse, and it is our collective responsibility as humans to choose the side that helps to propel us forward instead of destroying our species. Finally, I enjoyed his manner of responding to failure. Failure is a part of our lives and brilliant scientists like him are not immune to it either. So how did he personally deal with it? He bowled. Anytime, he did not do well on his exams, for instance, he would go out bowling. And in fact he, according to his own account, became quite a good bowler during his years of university. He even joined championships, but fortunately for us all, he did not change or abandon his allegiance and remained true to his scientific inquiries instead of competing as a professional bowler. It must be said that Gates Jr. was quite courageous to pick a relatively new topic for his thesis, namely string theory. The downside was that there was not too much research about it; the upshot was that during his defense he could make things up as he went along as his supervisors did not have the previous knowledge or background to challenge him in any meaningful way. On a final note, I had my own test at this lecture. The quite affable and humorous Outreach director Marcello Pavan from TRIUMF had claimed that he would allow younger audience members to ask their questions first; the shorter you were the higher your chances to be picked during the Question and Answer period. So for the first time, I decided to bring my seven-year-old son along. It was his first astrophysical lecture and he has some budding interest already in the field, especially regarding black holes. However, his question was about the future of the universe; in fact, he wanted to know what would happen in a hundred years from now. True to his promise, Marcello Pavan did end up picking my son, and Gates Jr. explained that 100 years may be a lot for us humans, but for the universe it is even less than a snapshot. To put its 13.8 billion years of existence into perspective, we are the proverbial blimp on a long endless stretching line. That is something to be humble about, although many people take themselves for the center of the universe (they are not!). Overall, this was one of the higher-echelon lectures I had the pleasure of attending at this outstanding series. They did not only provide snacks in the form of popcorn, but also sufficient food for thought and Gates Jr. was apart from his credentials and experience also humorous and down-to-earth. I am already counting down to the next talk; hopefully, my son will come along not only to learn something new along the way but so I could have him ask my own questions during the Q & A session.